KeyTiger Part Number - KT3014-400-3825-01S. Dimensions: Total length - 400/15.75 (MM/INCHES) | Center-to-Center Mounting Distance Between Drilled Holes - 375/14.76 (MM/INCHES) | Diameter or Cross-section - 38|25mm or 1.5|0.98inches (Front|Side) (MM/INCHES). Wall & Door Type: Mountable on all types of walls & doors. Mounting bolts provided for different door types for mounting to up to 3 inches door thickness. Also included are 2 decorative fittings to be used on opposite side of door as well as drywall anchors & wood screws for wall applications (towel, closet). Instructions: Please refer to the manufacturer's website for detailed installation instruction (currently not provided in print with packaged product). For Door Applications: Drill and create thruholes on door between 0.315 - 0.600 inches in diameter on the door with a Center-to-Center Mounting Distance as specified above. For Wall Applications: Drill and create thruholes on the wall of EXACTLY 3/8" (0.375 inches) in diameter with a Center-to-Center Mounting Distance as specified above. Center distances between drilled holes REQUIRE an accuracy of 1/16". 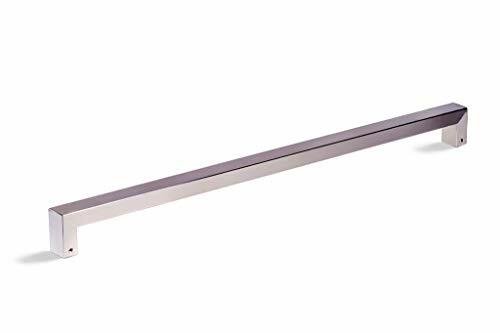 For Back-to-Back (PAIRED) Version of this Single-Sided Pull for Doors: Search Amazon.com for KT3014-400-01. KeyTiger's MODERN & Contemporary design can be used to mount as a space-saving, low-profile (gap of ~1.65") towel bar (wall application) or as a single-sided door handle/pull and works for up to 3" thick doors and is available in various lengths in inches/feet. All accessories provided for both types of installation (wall & door). When used as a door handle/pull, they do NOT lock and is typically used in conjunction with deadbolt hardware and/or door catches. Made from high-strength, high-endurance stainless steel 304 alloy material (for rust, corrosion and stain resistance, and rugged usage), which makes the products suitable for both indoor and outdoor applications, under any weather condition. Applications: Used as a towel bar or for entry/entrance door handle, wood or glass door pulls, interior/exterior front doors, shops, shower bathroom, kitchen cabinets, gate, wine cellars, barn sliding door knob from small to large/big. Product packaging with 1) KeyTiger(TM) label & 2) RED printing on box ensures product authenticity. NOTE: A single purchase (1 unit) of this product provides you with only a single (1 side) of handle (or towel bar). If you have any questions about this product by KeyTiger Door Pulls & Handles, contact us by completing and submitting the form below. If you are looking for a specif part number, please include it with your message.